Thanks to Dr. Teresa S. Hyun, Fred Hutchinson Cancer Research Center / University of Washington, Seattle, Washington (USA) for contributing this case and Dr. Hillary Zalaznick, Myriad Genetics, Inc., Utah (USA) for editing the discussion. To contribute a Case of the Week, first make sure that we are currently accepting cases, then follow the guidelines on our main Case of the Week page. (2) Please bookmark and use our Amazon.com link to shop at Amazon.com, and at the same time, help PathologyOutlines.com. We receive a commission (~ 5%) from all purchases made through this link, whether pathology related or not, at not cost to you. 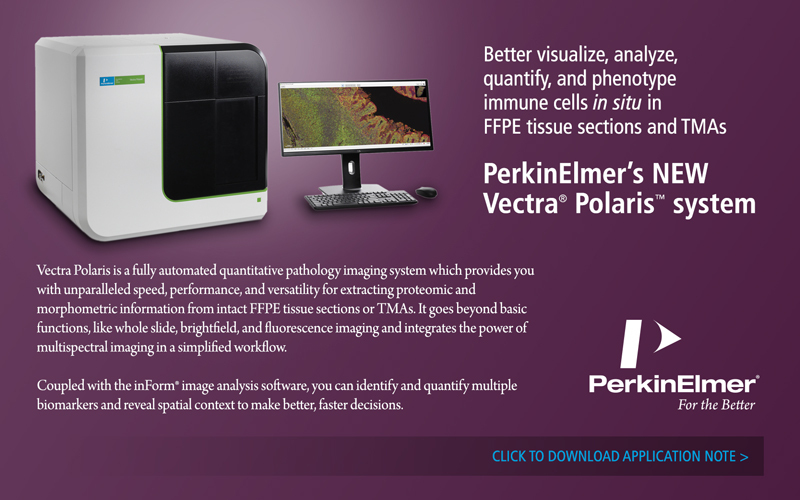 You benefit from a wide selection of products at a low price, and the knowledge that you are helping us maintain and expand our free website for the pathology community. (3) You can find Pathology related humor as well as archived copies of the What's New in Pathology newsletter on the Newsletters and Humor page. 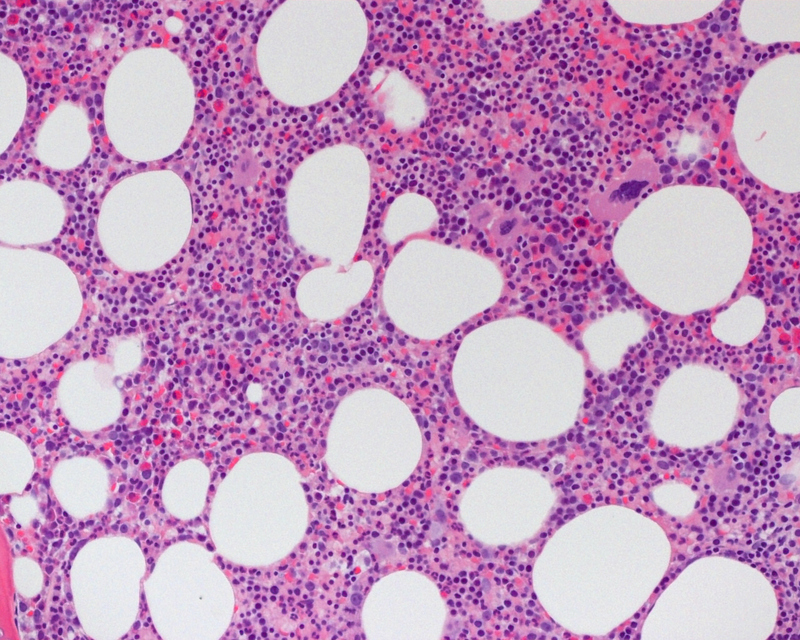 A 65 year old man presented with leukocytosis (WBC 39.6 x 109 / L), splenomegaly and periportal lymphadenopathy. A peripheral smear and bone marrow biopsy were obtained. Which one of the following is not a shared feature of hairy cell leukemia and hairy cell leukemia - variant? 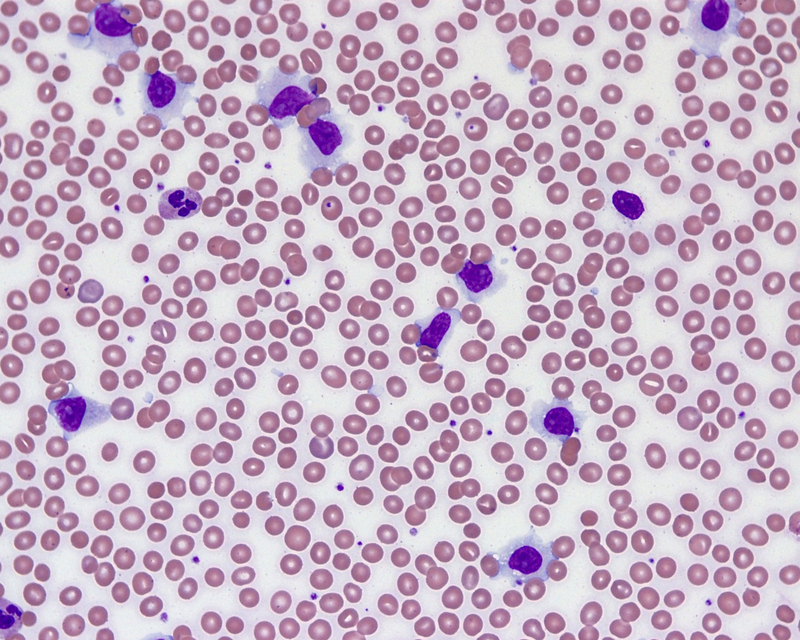 The peripheral blood smear shows a lymphocytosis with abnormal lymphocytes. The abnormal lymphocytes have nuclei with visible nucleoli and moderate to abundant, lightly basophilic cytoplasm with scattered hair-like projections. 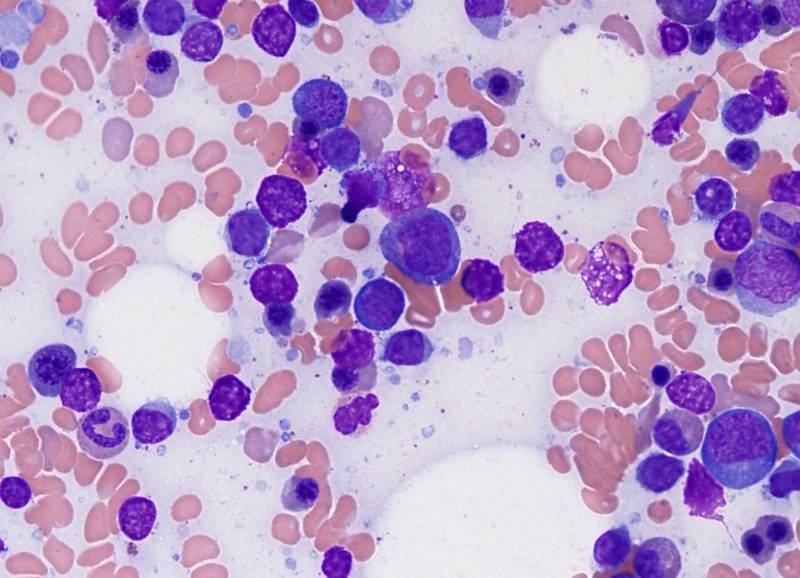 An increased population of similar appearing abnormal lymphocytes is present in the bone marrow aspirate smears. 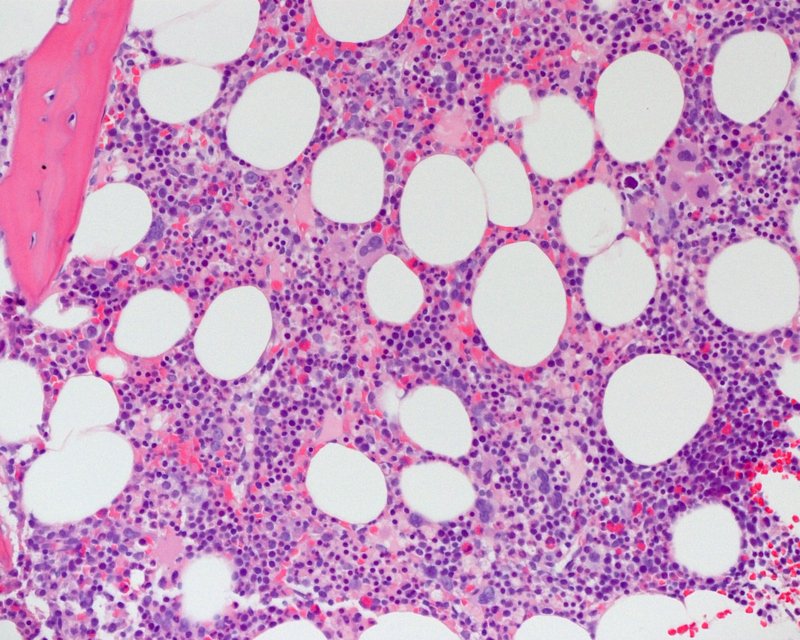 The bone marrow core biopsy shows abnormal lymphocytes present interstitially and in clusters. CD20 confirms this population as B cells and highlights elongated clusters suggestive of sinusoidal involvement. 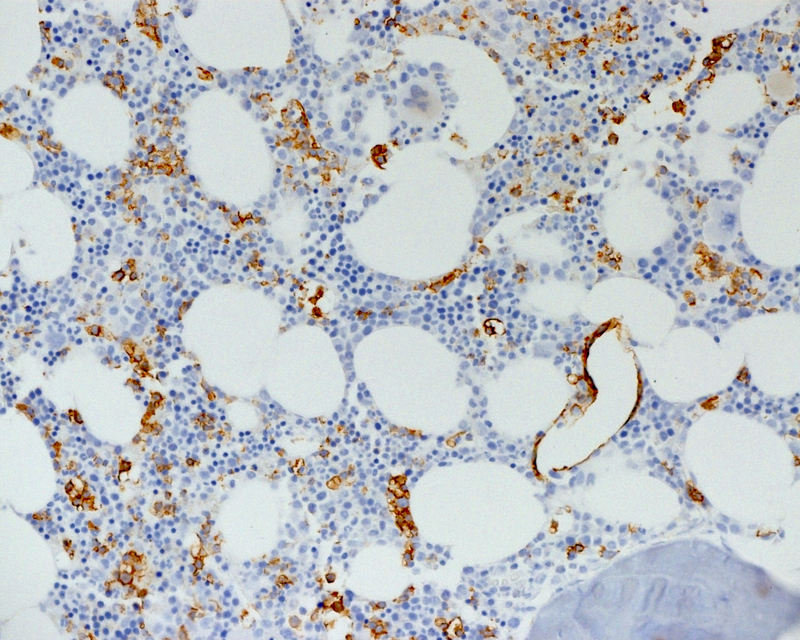 Additional immunohistochemistry shows positive staining for DBA-44 and negative staining for annexin A1 (not shown). 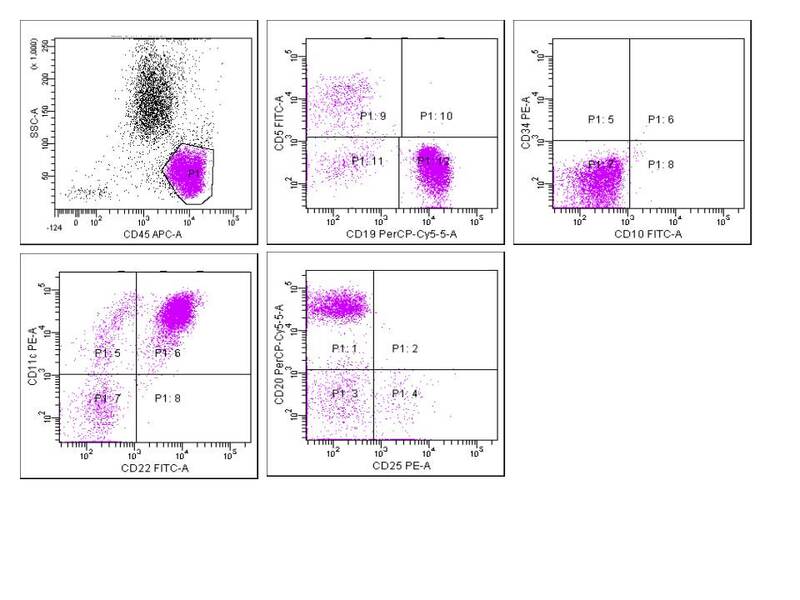 Flow cytometry of peripheral blood and bone marrow demonstrates abnormal B cells with expression of B cell antigens CD19, CD20, CD22 and CD79a, as well as expression of CD11c and CD103, with absence of surface immunoglobulin, CD5, CD10, CD23, CD25 and CD34. 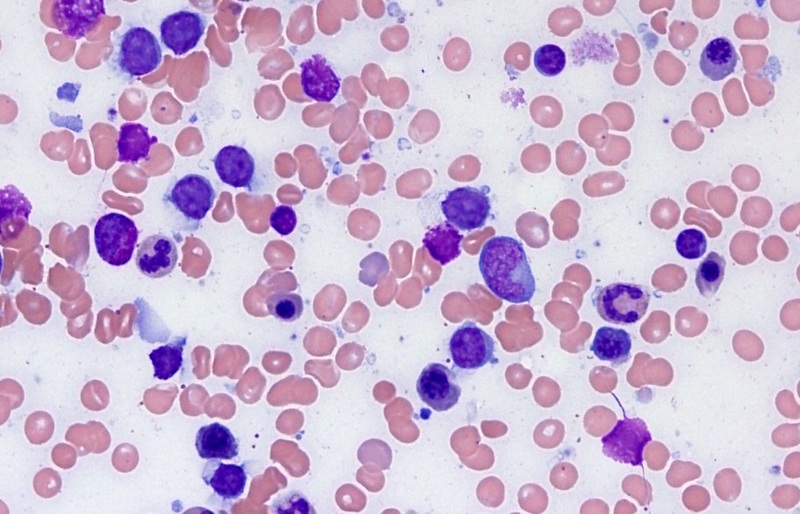 These features are consistent with hairy cell leukemia - variant (HCL-v). Hairy cell leukemia (HCL) represents 2% of leukemia diagnoses, or approximately 900 new cases each year. It primarily affects adult men, with a median age of 55, and a male:female ratio of 4:1. Apparent risk factors are exposure to diesel fuel, organic solvents, pesticides and herbicides. HCL is considered a service related illness for veterans exposed to Agent Orange. The classic symptoms are anemia, thrombocytopenia, leukopenia and splenomegaly. Granulocytopenia and monocytopenia lead to bacterial and opportunistic infections (e.g., mycobacteria, Listeria, fungi, pneumocystis and flares of herpes zoster). Some patients experience autoimmune complications from vasculitis or an inflammatory arthropathy similar to rheumatoid arthritis (Blood Rev 2014;28:197). Hairy cell leukemia is a small B cell neoplasm, composed of mononuclear cells of small to medium size with abundant, lightly basophilic cytoplasm with circumferential “hairy” projections on smears. Cells have an oval or bean shaped nucleus, “spongy” chromatin with slightly less clumping than a normal lymphocyte, and a small inconspicuous or absent nucleolus. Tumor cells are predominantly in the bone marrow and red pulp of the spleen, with few cells in the peripheral blood (Swerdlow et al: WHO Classification of Tumours of Haematopoietic and Lymphoid Tissues, 2008, 4th edition). The cells express CD20, CD19, CD11c, CD25, CD103, CD123, DBA-44 and annexin A1, and typically have a BRAF V600E mutation (Am J Clin Pathol 2015;143:120, Blood Rev 2014;28:197). The bone marrow may be difficult to aspirate because of fibrosis (Swerdlow et al: WHO Classification of Tumours of Haematopoietic and Lymphoid Tissues, 2008, 4th edition). 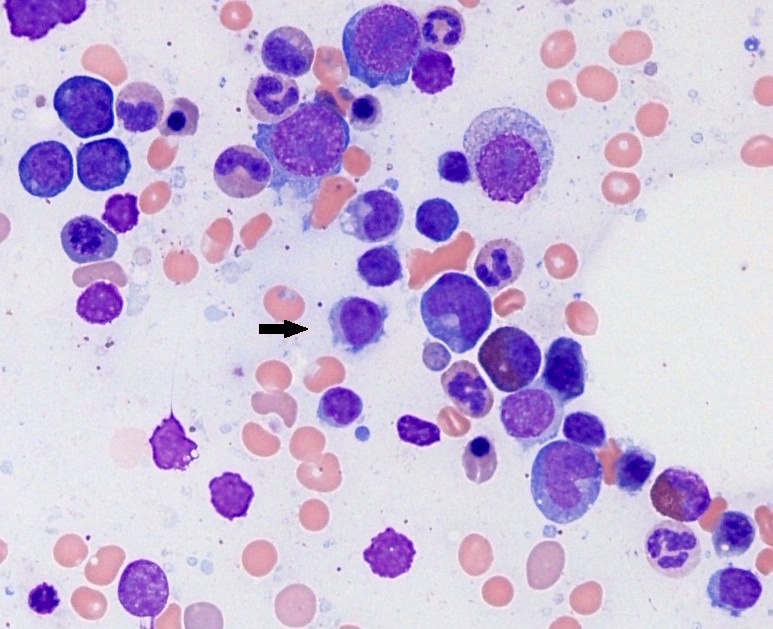 Hairy cell leukemia - variant (HCL-v) resembles HCL, but is considered a distinct clinical entity (Blood Rev 2014;28:197). It usually presents in older patients (Am J Clin Pathol 2015;143:120), with more moderate anemia and thrombocytopenia. White blood cell count is generally elevated, and there is a normal absolute monocyte count. Morphologically, cells lack circumferential hair-like projections, although some hairy projections are typically present (Swerdlow et al: WHO Classification of Tumours of Haematopoietic and Lymphoid Tissues, 2008, 4th edition). HCL-v cells can have prominent nucleoli, imparting a prolymphocytic appearance, or can have dispersed chromatin and irregular nuclear contours. 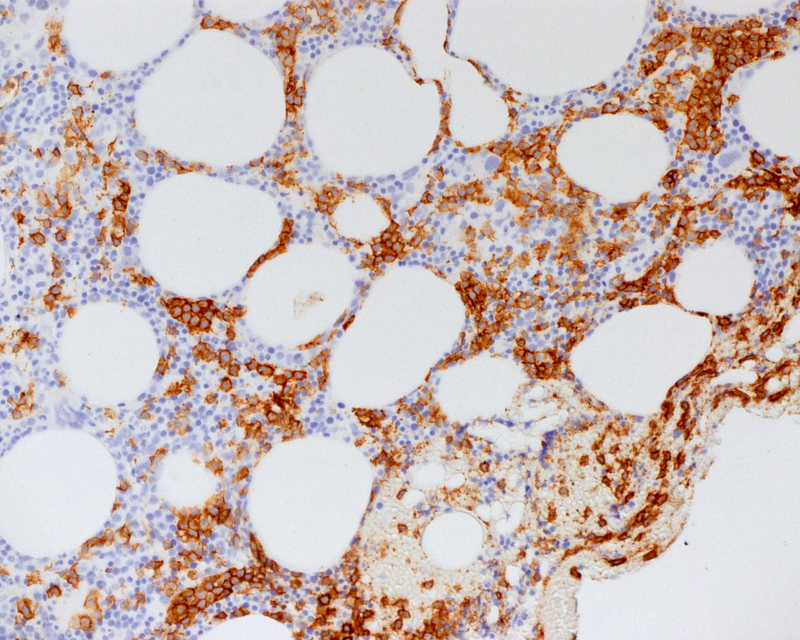 HCL-v is usually negative for CD25, annexin A1 and CD123, and is BRAF wild type (Blood Rev 2014;28:197, Swerdlow et al: WHO Classification of Tumours of Haematopoietic and Lymphoid Tissues, 2008, 4th edition). The bone marrow shows distinctive sinusoidal involvement and there is less reticulin fibrosis than in classic HCL (Swerdlow et al: WHO Classification of Tumours of Haematopoietic and Lymphoid Tissues, 2008, 4th edition). When first described in the 1950’s, HCL was typically diagnosed late and patients died of infections or bleeding complications. Currently HCL is not curable, but can be controlled for long periods with purine nucleoside analogs such as pentostatin and cladribine. The life expectancy for patients with classic HCL is near normal, although patients may be at higher risk for other lymphomas, thyroid cancer and possibly melanoma (Blood Rev 2014;28:197). HCL-v, on the other hand, is more aggressive; does not respond well to purine analogs, but can be more responsive to nonstandard therapy such as cladribine with rituximab, or anti-CD22 immunotoxin (Swerdlow et al: WHO Classification of Tumours of Haematopoietic and Lymphoid Tissues, 2008, 4th edition). The median overall survival is about nine years (Clin Cancer Res 2013;19:6873). HCL-v should be distinguished from other B cell neoplasms that have cytoplasmic projections on peripheral smears. 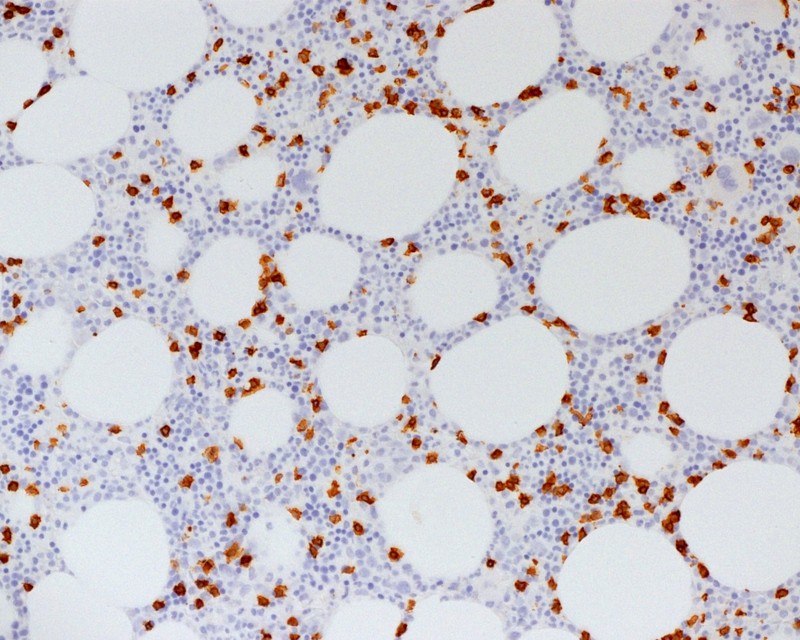 Splenic marginal zone lymphoma (SMZL) also presents with splenomegaly and villous lymphocytes in the peripheral blood, and is negative for annexin A1 like HCL-v. SMZL is generally negative for CD11c and CD103, however, and involves the white pulp of the spleen (Swerdlow et al: WHO Classification of Tumours of Haematopoietic and Lymphoid Tissues, 2008, 4th edition, Wick: Silverberg's Principles and Practice of Surgical Pathology and Cytopathology, 5th ed, 2015). SMZL is more indolent than HCL-v and responds better to therapy (Clin Cancer Res 2013;19:6873). The cells of splenic diffuse red pulp small B cell lymphoma (SDRPL) can also have cytoplasmic villi. Like HCL-v, it diffusely involves the red pulp and bone marrow sinusoids. SDRPL is also positive for DBA-44, and negative for annexin A1 and CD25, but is typically negative for CD103 and CD11c. SDRPL is indolent and responds to splenectomy (Swerdlow et al: WHO Classification of Tumours of Haematopoietic and Lymphoid Tissues, 2008, 4th edition). Because the nuclear features of HCL-v can have a prolymphocytic appearance, B cell prolymphocytic leukemia (B-PLL) may be in the differential. The cells of B-PLL lack cytoplasmic projections, however, and immunophenotyping will distinguish the two entities. B-PLL is aggressive and has a median survival of 30 - 50 months (Swerdlow et al: WHO Classification of Tumours of Haematopoietic and Lymphoid Tissues, 2008, 4th edition). B. Classical hairy cell leukemia is almost always positive for BRAF V600E mutation, but HCL-v is not.